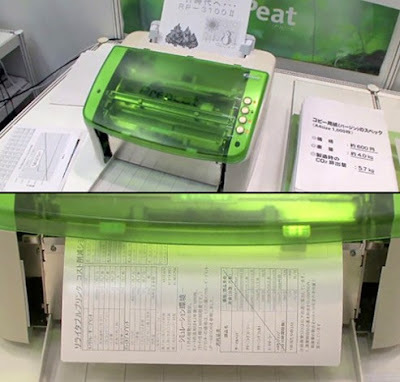 A neat idea for green office, PrePeat Desktop Printer is a Japanese invented technology with eco-friendly capability. The PrePeat Desktop Printer comes with heat sensitive plastic paper sheets that’s erasable and can be reused up to 1,000 times. Despite the arguments regarding cost effectiveness for medium and small businesses, this PrePeat Desktop Printer has become a remark of revolutionary office’s green gadget that is capable of reducing conventional paper usage. It has been a general knowledge that world is facing paper shortage within the last two years while the issue of global warming as the result of excessive industry pollution on our earth has become a major issue these days.